On August 19, 2010, Jérémie Gaillard made an interesting discovery when looking at the surface of the lake Etang de l´Alleu which is located in the French community of Saint-Arnoult-en-Yvelines. The water was covered with pollen, on which droplets of dew had formed. In these droplets two colourful rainbows were visible. 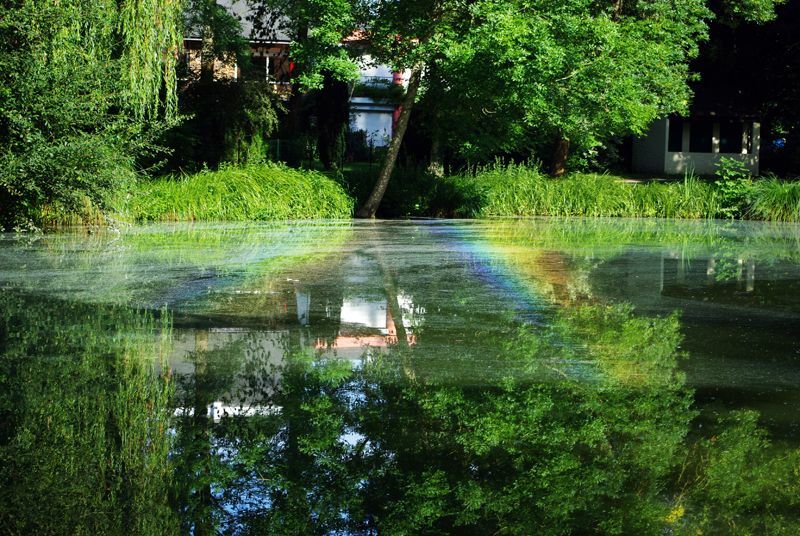 Dewbows can be understood as the lower part of a rainbow projected onto a horizontal plane. When a dewbow is fully developed, a semi-circle which opens towards the sides should be visible, the apex of which is situated at the lower end of the observer´s shadow. Equivalent to normal rainbows, primary and secondary dewbow should run parallely, but in Jérémie Gaillard´s observation they did not. Instead, the second colourful bow fragment is a reflected sunlight dewbow. The surface of the water acts as a large mirror reflecting the sun. The reflected image of the sun now acts as a second source of light, which is situated as far below the horizon as the sun is above it. (angle of incidence = emergent angle). So the antisolar point for the reflection of the sun is above the horizon. This reflected antisolar point, which is located the double of the real sun´s elevation above the antisolar point, is the centre of the two rainbow circles for the reflected sunlight. So the additional rainbows are displaced upwards by the double sun elevation compared to the primary and secondary rainbow, making a rather unfamiliar appearance in the open nature.